Channahon, Minooka women create lollipop trees ‘planted’ in memory of those lost to cancer | Handing H.O.P.E. JOLIET – As time has passed, fewer people mention Addison Locke as often as they once did. 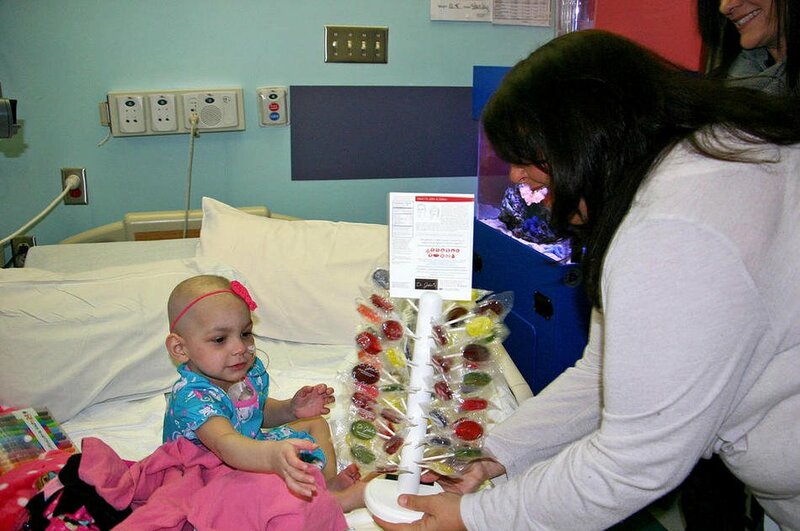 That’s why Steve Locke, athletic director at Joliet Central High School, and his wife, Erin Locke, third-grade teacher at Troy Craughwell Elementary, were thrilled to have their daughter remembered at Lurie Children’s Hospital with a lollipop tree by friends Steve and Stephanie Millsaps. The lollipop tree is the brainchild of Jen Coffel and Kim Bavilacqua, founders of the new nonprofit organization Handing H.O.P.E. Anyone who has gone through cancer treatments can tell you it literally leaves a bad taste in your mouth. For a child, having the sweet taste of a lollipop to cover the bad taste can make a big difference during a difficult time. After doing research, Coffel and Bavilacqua found Dr. Johns healthy lollipops, which are made with Xylitol and proven to be a safe sweetener, Coffel said. The two friends – one from Channahon, the other from Minooka – wanted to do something to help kids battling cancer after their own lives were affected by the disease. Bavilacqua is a cancer survivor herself. Coffel lost her dad, mom and a best friend to cancer in just two years. Once they got through their own grief, they founded Handing H.O.P.E. with a mission of helping others through prevention and education, as well as provision and evangelism. The lollipop tree project was created to help children with cancer and as a way of honoring the memory of those who have died from the disease. Each tree is “planted” in memory of someone as a way to carry on their legacy. The first lollipop tree was planted in honor of Coffel’s dad at Northwestern Medicine Proton Center in Warrenville. More cancer centers got on board with the project and four more trees were planted at Lurie Children’s Hospital, including one in memory of 7-year-old Addison Locke, who died in 2013 from a rare liver cancer. Seven trees have been “planted,” and seven more are on the list, including one in South Carolina, which will be hand-delivered by Coffel and Bavilacqua. A hospital in California also has shown interest. “Being nationwide is our goal. We want to be in every state,” Bavilacqua said. While the project is gaining momentum, there’s a lot more work to be done for the organization itself. In order to maintain the trees, they need to be “watered” with lollipops on a regular basis. Hospitals easily go through 10 bags of lollipops a month, which will cost Handing H.O.P.E. $3,000 per year per tree. Bavilacqua and Coffel are hoping to bring business and corporate sponsors on board to help fund the replacement lollipops. In the meantime, Handing H.O.P.E. will continue its mission to help ease the suffering of children with cancer. Little eyes lit up as Bavilacqua and Coffel walked the week of March 4 through the halls of Advocate Children’s Hospital in Oak Lawn with a lollipop tree. The pair were delivering their seventh lollipop tree to be planted at Advocate. Even family members and staff were encouraged to pick from the tree. Two-year old Zoey Coughlin reached out for the lollipops with both hands as they entered her hospital room. Despite the medical tubes and wires attached to her body, Zoey was all smiles.